Missing cat! 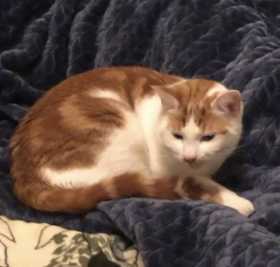 He responds to the names doofus or kitty, he is mainly white white large orange patterns on his body and face, his tail is mainly orange with white rings. He's neutered and 11 months old. He's sweet but can be wild and playful. Please help us find him we are worried because he loves the outdoors and sneaks out of the house a lot, but with this cold weather we are concerned over his well being. He went missing around January 31 and has not been seen since.